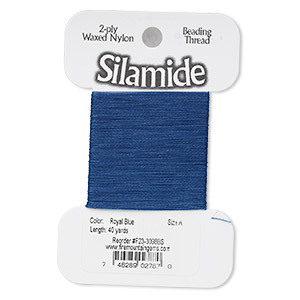 Thread, Silamide, 2-ply waxed nylon, royal blue, size A, 4-pound test. Sold per 40-yard card. Item Number: H20-3098BS Have a question about this item? 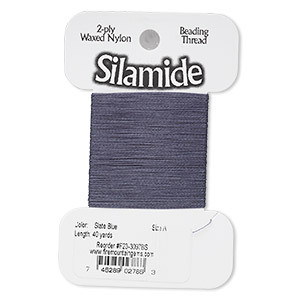 Silamide thread is a twisted, two-ply waxed nylon beading thread with supple strength, resilience and colorfastness. It's a leading favorite among top designers, ideal for peyote stitch, brick stitch, loom weaving and beads with small holes. Color may vary from dye lot to dye lot. Thread tensile strength is approximately 4 pounds, 4 ounces. 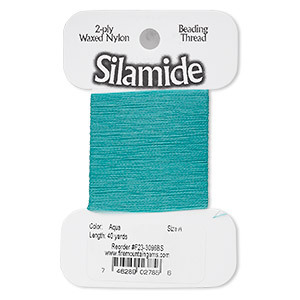 Thread, Silamide, 2-ply waxed nylon, aqua, size A, 4-pound test. Sold per 40-yard card. Thread, Silamide, 2-ply waxed nylon, dark blue, size A, 4-pound test. Sold per 40-yard card. 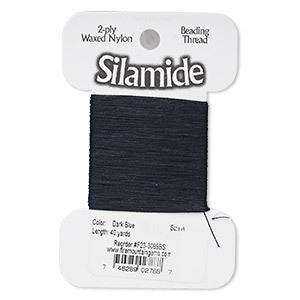 Thread, Silamide, 2-ply waxed nylon, slate blue, size A, 4-pound test. Sold per 40-yard card. 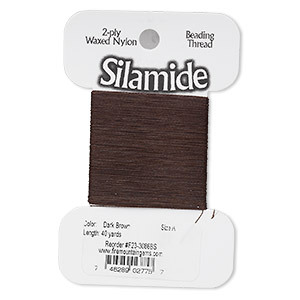 Thread, Silamide, 2-ply waxed nylon, dark brown, size A, 4-pound test. Sold per 40-yard card. 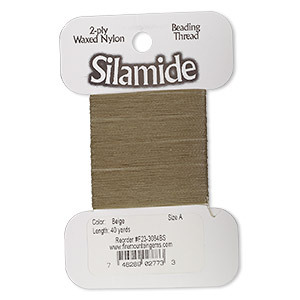 Thread, Silamide, 2-ply waxed nylon, beige, size A, 4-pound test. Sold per 40-yard card. 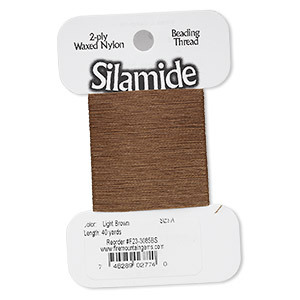 Thread, Silamide, 2-ply waxed nylon, light brown, size A, 4-pound test. Sold per 40-yard card. 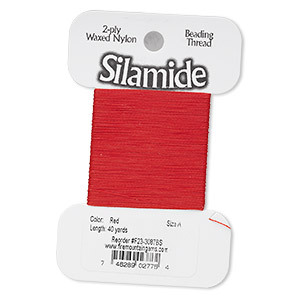 Thread, Silamide, 2-ply waxed nylon, red, size A, 4-pound test. Sold per 40-yard card. 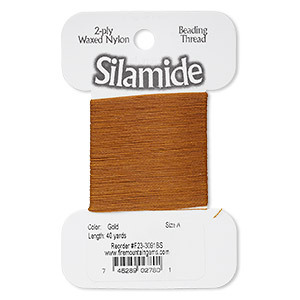 Thread, Silamide, 2-ply waxed nylon, gold, size A, 4-pound test. Sold per 40-yard card. Thread, Silamide, 2-ply waxed nylon, dusty rose, size A, 4-pound test. Sold per 40-yard card.